Widespread resistance is unfolding in Palestine, in response to the U.S-backed mass arrests, indefinite detention and bombing raids by Israel. The Israelis unleashed this latest attack, mainly against Gaza but also in the West Bank, using the kidnapping and killing of three Israeli teenagers as justification. The Israeli government claims Gaza governing party Hamas was responsible, although Hamas has stated they are not and condemned the killings. 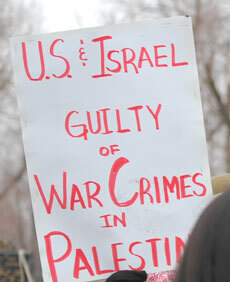 Israel has presented no evidence to prove guilt, but rather has unleashed its own crime of mass collective punishment. According to reports, there have been massive arrests of more than 640 Palestinians since mid-June, injury to more than 170 and the death of more than a dozen, along with home demolitions and more recently bombing raids against Gaza. The attack was also reportedly planned in advance, timed to occur before upcoming Palestinian elections. They aim in part to divide Palestinians and block development of the recently announced unity government, bringing Gaza and the West Bank together. But indications so far are that the people of Palestine are rejecting this latest repression and uniting to say Enough! 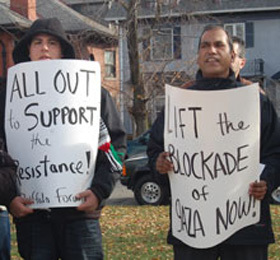 They are demanding an end to the U.S.-Israeli crimes, affirming their right to resist and carrying forward their fight to Free Free Palestine! Thousands have demonstrated and clashed with Israeli police, especially after the brutal killing of a teenage Palestinian youth by Israeli-backed settlers. These gangs are reminiscent of U.S. government-backed KKK lynch gangs, as they roam in groups in search of Palestinian youth to kidnap and kill. Numerous reports of attempted kidnappings have been made, but most have been blocked by mass actions by the Palestinians. President Obama issued a statement condemning the killing of the three Israeli youth: “The United States condemns in the strongest possible terms this senseless act of terror against innocent youth…As the Israeli people deal with this tragedy, they have the full support and friendship of the United States.” Given the U.S. backs and funds the Israeli military and police, the U.S. has not condemned the bombing raids on civilians and mass arrests and home demolitions. As well, no similar statement was issued by the president for the Palestinian youth who was kidnapped and burned to death. His press secretary did state: “The United States condemns in the strongest possible terms the heinous murder of Palestinian teenager Mohammed Hussein Abu Khudair. We send our condolences to his family and to the Palestinian people.” Nothing about the “full support and friendship of the United States.” Instead, as is common, while not condemning the Israeli military and police attacks against Palestinian civilians, his press secretary added: “We call on the government of Israel and the Palestinian Authority to take all necessary steps to prevent an atmosphere of revenge and retribution.” In this manner, Israeli crimes are sanctioned, while Palestinians are called on not to resist. In addition, the U.S. State Department has not assisted the family of a 15-year old U.S. youth from Tampa, Florida whose family have been visiting relatives in Palestine. He was brutally beaten and placed under indefinite detention and remains in jail, despite efforts by his family to secure his release. Reading the reports of the police actions and brutality, one cannot help but see the resemblance to police actions and brutality in the U.S. against African American youth. Profiling, unjust arrests and beatings, all done with impunity. 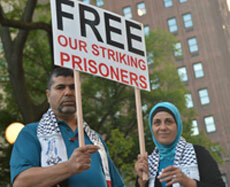 The hunger strikers are inspiring all Palestinians in their firm efforts, and the just struggle of all Palestinians for their rights are inspiring the world’s people. Voice of Revolution stands with the Palestinians in condemning the U.S./Israeli crimes and demanding an end to collective punishment and an end to the occupation. 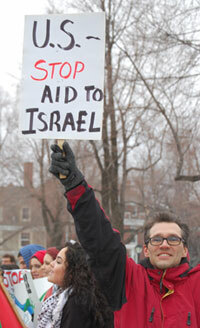 End All Aid to Israel Now! 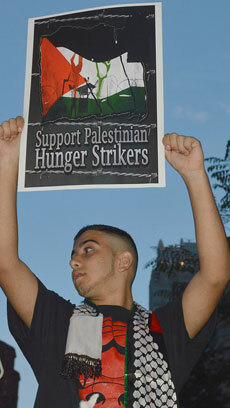 We salute the resistance and urge all to join in defending the hunger strikers and supporting all the Palestinians in their just struggle for their rights. Thousands of Palestinians participated in massive protests held in different parts of historic Palestine July 4, denouncing the ongoing Israeli aggression on Gaza, and the brutal killing of Mohammad Abu Khdeir, who was kidnapped, tortured and burned to death by Israeli extremists, in Jerusalem. The protesters chanted against the escalating war crimes against the Palestinian people, [waved Palestinian flags and chanted, “Enough of the suffering, enough of the pain.”] More protests will be held in different parts of the country. Hundreds marched in Majd al-Kroum in the Upper Galilee, while hundreds also marched in the al-Fredees village, Jisr az-Zarqa coastal town, chanting against the escalating Israeli crimes and violations carried out by Israeli soldiers and settlers against the Palestinian people. The protesters carried Palestinian flags and posters calling for ending aggression against the Palestinian people, an end to racism, and calling on the Israeli government to put an end to those crimes. They expressed solidarity with the family of Abu Khdeir, and all Palestinians living under constant Israeli aggression in the West Bank, the Gaza Strip and occupied Jerusalem. 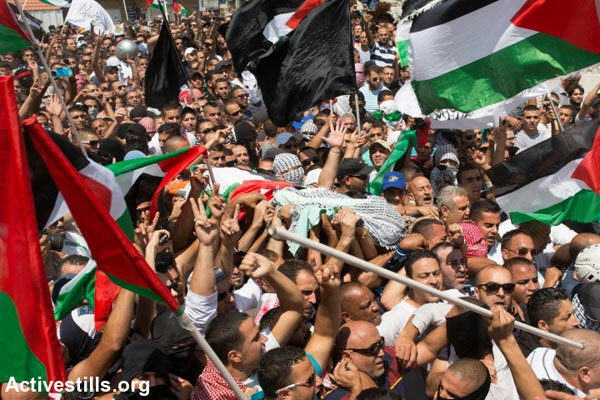 Hundreds also marched in Sakhnin and in Majd al-Kroum, denouncing the torture and execution of Abu Khdeir. Several Arab Members of the Knesset, political leaders and public figures participated in the protests. On July 3, Israel conducted bombing raids against Gaza, attacking 15 targets medics said. Gaza health ministry spokesman Ashraf al-Qidra said 11 Palestinians were hospitalized following the multiple airstrikes, including a 17-year-old boy who sustained shrapnel wounds near Gaza City. An elderly woman and teenage girl sustained injuries from the bombings in the northern Gaza Strip. The airstrikes are collective punishment and an effort by Israel to weaken Hamas and block efforts by Palestinians to develop a unity government. Widespread resistance took place the same day, as thousands of Palestinians demonstrated and protested the continued siege of Gaza and the killing of 16-year-old Palestinian Muhammad Abu Khdeir from the Shufat neighborhood. A report from Palestinian news agency Ma'an said more than 170 Palestinians were injured in clashes with Israeli forces in occupied East Jerusalem on Wednesday following the kidnapping and killing. At least 35 people were injured by rubber bullets, including six journalists, and three people suffered fractures after being assaulted by Israeli police officers. Palestine TV reporter Kristine Rinawi and cameramen Ali Yasin and Ahmad Gharabla were among those reported injured. Rajih al-Hawarin, a Red Crescent paramedic, said soldiers were firing tear gas, rubber-coated bullets, stun grenades, and live fire at protesters. Hundreds of masked Palestinians faced off with Israeli police in riot gear. As the clashes raged in Shufat, where the streets were littered with burning dumpsters and makeshift barricades, the only place of relative calm was the family home, an AFP correspondent said. Ansam Abu Khder, one of the teenager's cousins, said witnesses had written down the car's license plate and that police were examining CCTV footage. "We knew about Mohammed's kidnapping by three Israelis just before the dawn prayers. A witness saw them and took down the license plate," he told AFP. The family denied allegations that the boy could have been killed in a family dispute, citing eyewitnesses as saying they tried to stop the kidnapping but the suspects took Abu Khdeir and fled the scene. Israeli police circulated the disinformation that Abu Khdeir was killed by family because he was gay, all in an effort to divide resistance and divert from the role of the Israeli state in the arrests, indefinite detention, killings and unleashing and protecting of terror squads of settlers, reminiscent of KKK-style lynchers. The families of the three Israeli teenagers killed issued a statement condemning the incident. 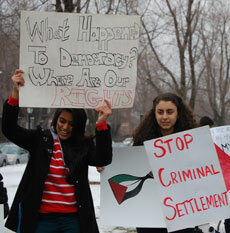 "If the Arab youth was murdered because of nationalistic motives then this is a horrible and horrendous act," it said. "There is no difference between Arab blood and Jewish blood. Murder is murder. There is no forgiveness or justification for any murder." Fifteen-year-old Palestinian-American Tariq Abukhdeir, cousin of recent lynching victim Muhammed Abu Khudair, was brutally beaten by masked Israeli police on Thursday evening, July 3, in the Shuafat neighborhood of occupied East Jerusalem. He has since been arrested and held without charge and denied medical treatment, according to his family and the rights group Addameer. Tariq’s family lives in Tampa, Florida and have been on vacation in Palestine since early June. They are scheduled to return to the United States on July 16. Tariq’s next court hearing is scheduled for Sunday, July 6. As photos of Tariq’s horrific facial bruises surfaced, so did two videos that show masked Israeli officers punching, kicking and dragging a handcuffed Palestinian in Shuafat. Salahedeen Khdeir, Tariq’s father, told The Electronic Intifada by phone from Shuafat that the Palestinian in the video is his son Tariq and that the footage was recorded by neighbors who then released it to a Palestinian media outlet. Salahedeen says Tariq was visiting his uncle’s house in an area devoid of clashes between Israeli forces and Palestinians when he and five other youths were attacked in the yard by two masked Israeli police agents. Tariq was roughed up the worst, beaten so badly that he lost consciousness. But that didn’t stop the Israeli forces from arresting Tariq and the others without charge and preventing Tariq from receiving medical treatment for five hours. “Tariq was arrested at 7:35pm but wasn’t transferred to the hospital until around 1:30am,” said Salahedeen. During those five hours his parents were prevented from seeing him as well. At the police station, Salahedeen came face to face with his son’s attackers, who called Tariq “a tough boy” and claimed he tried to attack them. Tariq’s parents did not see him again until Friday July 4 in an Israeli court where the judge extended his imprisonment another 48 hours as requested by the Israeli police, who argued they still needed to question him. The officers told the judge that Tariq and his cousins were throwing stones, an accusation Tariq and his family vehemently deny. 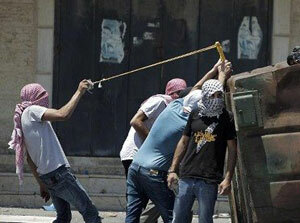 When asked if they had any witnesses to the alleged stone throwing, the officers said no, Salahedeen recounted. “Tariq is scared,” said his father, adding that his son speaks very little Arabic and no Hebrew, making an already nightmarish ordeal even more terrifying for the 15-year-old. Salahedeen begged the judge to let him stay with Tariq in jail so he so he could check his son’s urine for blood each time he uses the bathroom, as advised by the doctor who treated the boy. This has led his family to fear that he may have internal bleeding. The judge denied Salahedeen’s request, promising that she would personally notify the jail to look after Tariq. Salahedeen says he has an appointment on July 5 with the US consulate, which had not yet responded to a request for comment. The Palestinian prisoner rights organization Addameer reports that Tariq is one of eleven Palestinians who were beaten and arrested in Shuafat on Thursday, many of whom were minors. “The continued state-sanctioned violence against children is unlawful and unacceptable,” Addameer stated in an appeal for protests against Tariq’s treatment. As Israel conducts a wave of mass home break-ins and arrests across the West Bank in retaliation for the alleged kidnapping of three youth from one of its illegal settlements, a new report documents that Palestinian children are at much greater, ongoing risk from Israeli forces. According to the report issued today by the Euro-Mid Observer for Human Rights, Israel seized an estimated 2,500 Palestinian children and youth between January 2010 and June 2014 – with approximately 400 just 12-15 years old. To date, Israeli authorities have raided more than 1,500 Palestinian homes and businesses and arrested more than 550 Palestinians, in a search for the kidnappers and an attempt to wipe out the Hamas political party, which it has labeled as responsible without citing evidence. Six Palestinians have died as a result – including a 14-year-old boy who was shot in the chest at point-blank range and a 78-year-old woman who suffered a heart attack during a house raid. 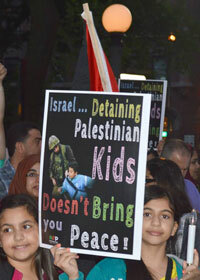 Euro-Mid is calling for equal coverage of the plight of Palestinian children by the international media, and for the signatory states of the Geneva Conventions and other international stakeholders to bring all pressure at their disposal (including denial of financial pacts and assistance) on Israel to immediately halt violations of their human rights. The Euro-Mid Observer for Human Rights is a nonprofit, nongovernmental human rights organization dedicated to exposing human rights violations and defending human rights. On 12 June 2014, three Israeli settlers disappeared from the Occupied Palestinian Territory (OPT). Since their disappearance, Israel has engaged in large-scale searches, closures, and raids across the OPT, resulting in the killing of two Palestinians, Ahmad Sama’da, 20, and Mahmoud Dudeen, 15. Additionally, one Palestinian was shot in the head and is said to be in a state of clinical death. 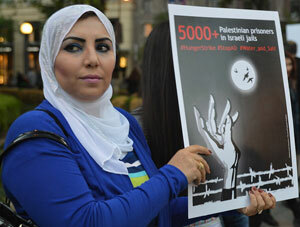 As of 21 June, Al-Haq has documented the detention of approximately 454 Palestinians across the West Bank. 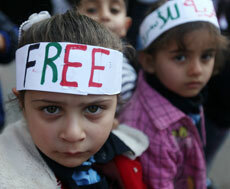 Further, 51 of the detained Palestinians had been released in the Shalit prison exchange deal in 2011. In total, 12 members of the Palestinian Legislative Council (PLC) have been arrested since 12 June, including the head of the PLC. The large-scale wave of arrests is reportedly accompanied with permission being given to Israeli interrogators to resort to “moderate physical pressure” against the Palestinian detainees. During late-night house raids, Israel has also been ransacking houses and destroying private possessions while intimidating and harassing the residents of the West Bank in reprisal for the missing settlers. The closure of checkpoints, particularly the Container checkpoint east of the City of Bethlehem, has led to further restrictions on the freedom of movement of approximately 100,000 Palestinians, many of whom are university students. Furthermore, many Palestinian residents in the West Bank have been forced to limit their movement as a result of a dramatic escalation in settler violence. As the Occupying Power, Israel is obligated to carry out its search for the missing settlers in line with its obligations under international human rights law (IHRL) and international humanitarian law (IHL). IHRL obligates Israel to respect the right to life of Palestinians by ensuring that the use of force and firearms by law enforcement officials is carried out in a manner that minimizes damage and injury and respects and preserves human life. IHRL further prohibits arbitrary or unlawful interference with privacy, family, home and correspondence and affords all persons the right to liberty and security of person. As such, Israel may not arrest and detain Palestinians in a sweeping fashion; there must be a legal basis for each and every individual arrest. Furthermore, all persons that are arrested must be treated with humanity and respect for their inherent dignity. Israel is absolutely prohibited from resorting to torture, cruel, inhuman and degrading treatment. Unlike the ruling of the Israeli Supreme Court, Israel is not allowed to inflict so called 'moderate physical pressure' against Palestinians, regardless of the situation. Under IHRL, Israel is also prohibited from restricting the freedom of movement of the thousands of Palestinian civilians as a form of collective punishment. The grave infringement currently imposed on Palestinians in the OPT, in particular residents of Hebron, is not proportionate nor necessary to protect Israeli national security and is highly intrusive. Israel is also bound by IHL in the OPT. Particularly, Article 27 of the Fourth Geneva Convention defines the unequivocal duties of the Occupying Power, including the obligation to respect persons, their honor, freedom from physical or moral coercion and freedom from collective punishment. This entails a duty on Israeli occupying forces to protect civilians from all acts of violence or threats thereof, against humiliating punishment, and to ensure that homes do not become the object of arbitrary interference. While Article 27(4) of the Fourth Geneva Convention authorizes the Occupying Power to take stringent measures of “control and security,” such as imposing restrictions on movement or depriving individuals of their liberty, these can be adopted only on necessary security grounds, and in a manner that is not discriminatory. Significantly, the collective punishment of the civilian population is absolutely prohibited under Article 33 of the Fourth Geneva Convention, which forbids the Occupying Power to use "[c]ollective penalties and likewise all measures of intimidation […]." Article 75(2)(d) of the First Additional Protocol to the Geneva Conventions, reflective of customary law, confirms that collective punishments are prohibited at any time. The Israeli army has previously claimed to use closures as preventative and deterrent measures, despite international law recognizing their effect as being punitive and collective, in particular due to their indiscriminate nature. Furthermore, threats by the Israeli Government to expel Hamas officials from the West Bank to the Gaza Strip on the basis of allegations that the organization is responsible for the settlers’ disappearances not only amounts to indiscriminate collective punishment but also violates Article 49 of the Fourth Geneva Convention, which prohibits forcible transfers and deportations of protected persons in occupied territory. The violation of this provision amounts to a grave breach of the Geneva Conventions and as such may constitute a war crime under Article 8(2)(a)(vii) of the Rome Statute of the International Criminal Court. The manner in which Israel is carrying out so called Operation Brothers’ Keeper, including threats issued regarding Hamas officials, the re-arrest of Palestinian prisoners that were released under the Shalit prisoner exchange deal, the increasing number of administrative detainees despite an ongoing hunger strike in protest of Israel's illegitimate use of administrative detention, and the large scale closures and raids, raises grave concern regarding the actual purpose of Israel’s actions in the OPT — one that is not consistent with the alleged purpose of the investigation into the disappearance of the settlers. One must consider that Israel is obligated to protect the occupied Palestinian people – including during investigations surrounding Israelis. The EU must not give Israel a carte blanche for undertaking any measure – regardless of its implications on the Palestinians – they deem fit in their blindsided search for the three settlers. We recall that in 2011, Israel also engaged in collective punishment when carrying out a large-scale investigation in the village of 'Awarta (Nablus governorate) and that the failure of the EU to properly address Israel’s so called investigation can only be seen as encouraging Israeli violations of Palestinians’ rights. To that end, we ask that the EU take strong action to ensure Israel's violations of international law during this investigation is not encouraged but rather restrained. Finally, it must be recalled that each individual EU member state, as High Contracting Parties to the Fourth Geneva Convention are under an obligation to ensure respect for its provisions [as is the U.S. — VOR ed note]. Voice of Revolution is posting below excerpts from a June 16 item by Ramzy Baround, published in the Palestine Chronicle. Although published before the Israeli Zionists' disinformation about the three missing Israeli youth came to light, the item outlines the Netanyahu government's attempt to manipulate the situation for self-serving reasons to undermine the unity of the Palestinian people, specifically the newly formed unity government between Hamas, the elected government in Gaza and Fatah in the West Bank. Israeli officials were quick to link the disappearance of the settlers — the 16-year-olds Naftali Frenkel and Gilad Shaar and the 19-year-old Eyal Yifrach — to the newly-formed unity government. A day after the three went missing, U.S. Secretary of State John Kerry phoned Israeli Prime Minister Netanyahu to express his government's concern. According to the daily Jerusalem Post, he also contacted Palestinine Authority (PA) President Mahmoud Abbas with the same message. The PA is reportedly cooperating. "The Israelis and the Palestinian Authority are working closely together on efforts to find the three teenagers and to hopefully bring a quick resolution to the matter," a Washington official told the Post. Meanwhile, Netanyahu is capitalizing on the story in every way he can. In his call with Kerry, he claimed that the alleged kidnappings were "the destructive result" of the newly formed PA unity government. U.S.-backed peace talks failed this year to take a step forward because Netanyahu carried on seizing Palestinian land and expanding settlements. He did not even fulfill the largely symbolic promise of releasing a few Palestinian political prisoners — something that would have allowed Abbas to save face and carry on with the talks. In a statement two days later to Israel Radio, Netanyahu described the gesture as "meaningless." Abbas' moves reflect how difficult his position remains since his Fatah party and Hamas reached an agreement in the Shati' refugee camp in April, which led to the formation of a transitional government in June. But this is only part of Abbas' dilemma. His security forces are allowed to currently operate in the West Bank -- but only under the watchful eye of the Israeli army. In return for allowing the PA a space for its operation, PA forces need to be involved in "security coordination" aimed at securing illegal Jewish settlements, reining in Palestinian groups and offering a line of defense for the Israeli army, which in reality is the one and only ruler of the West Bank and East Jerusalem. Unity or no unity, Netanyahu's expectations are unchanged: "I expect you to help in the return of the kidnapped youths and the capture of the kidnappers," Netanyahu told Abbas in a telephone interview on June 16. If these are indeed kidnappings, they could have been carried out other by groups. But Israel's targeting of Hamas can only be politically motivated. Abbas however is bound by his "commitment" to Israel's security, a condition through which he continues to receive support from the U.S. government. Recently, he even went as far as describing collaboration with the Israeli army as sacred.